For all your networking nuts, I got a question for you. Why are networks never as fast as promised on the box of a product? Same for everything, nothing is as fast as stated, just a quirk of marketing I guess. Wireless networks are no exceptions. In our previous review of the DWL-1000AP, we found out that a 802.11b wireless network will not perform at the peak 11mbp but it will perform VERY admirably, to the point that it can compete easily with 10Base-T Ethernet without a problem. With 802.11b being so reliable, fast, and easy to use, it's no surprise that more people are catching on and changing their wired networks to wires and it's also no surprise that D-Link is expanding their wireless product selection to cover routers as well as receivers. I can sense that the wireless networking boom will come in a few short months. Even looking at modern colleges, they are setting up massive 802.11b or other wireless networks to cover their entire campus and equipping freshmen PC Cards for their laptops so they can literally have the Internet at their fingertips. There is a lot of money to be made through wireless Internet because of the wire variety of uses it has in both commercial and personal applications. In the business world, it's ideal for connecting isolated and hard to wire areas of the office and also for the constant, everywhere, Internet access. For the home it's the same, no one wants unsightly CAT-5 cable running around the house or apartment and a wireless connection is a great way to get rid of it. Also it's awesome to finish a project while sitting in the tub with the laptop (NOT a smart idea though). Now I might be going off topic so lets get back on track. 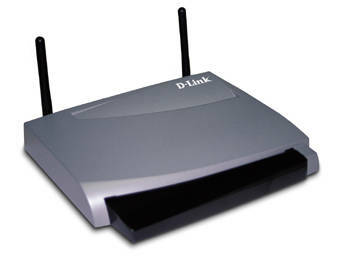 Today we have a new product from D-Link in our chop shop. It is a 802.11b Wireless Home DSL/Cable Router. The idea behind this product is obviously to introduce wireless networking into the home and allow wireless connections to integrate with wired connections. It's a step forward in technology for use in households. This is a product made to help people implement a wireless network in their homes along with their wired network. D-Link has been aggressively introducing new and better networking products in the wireless section for the past few months and it keeps improving and getting easier so that's a big plus for D-Link and their ongoing support for new technologies. Other companies such as Linksys, Sohoware, etc… have products but not near the selection available for different people as D-Link have. Most people who own routers like it for one main reason… it saves them money. How? First off, most ISP's that provide DSL/Cable Internet Access only gives you 1-2 IP's included in your service plan. You have to pay $5-25 more if you want more IP's. This is really a downside of broadband but an acceptable practice since most ISP lose money per IP because of the maintenance charges if they didn't charge for them. If you don't have a router and have 4 computers in the house, you might be paying $25 more a month for 2-3 extra IP's. If you do have a router bought for $200, you will save money by not having to pay for the extra IP's and also have added features such as a firewall.